At each Redditch Model Railway Exhibition we invite the visitors to vote for what they think is the best layout at the show. We feel rather than a group of our club members doing the judging that does happen at some shows this creates a far more balanced result. The cup we award is the John Jones Memorial Cup. John was a founder member of our club and was elected our Vice President on 2nd February 1971 and President on 5th March 1981 a post he held until his death on 15th October 1999 aged 82. 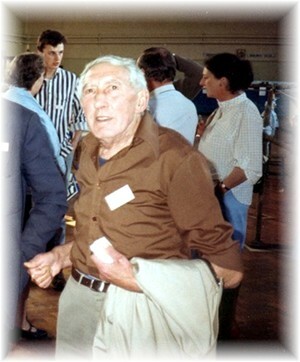 John had an infectious enthusiasm for model railways and being a skilled engineer by profession he was very proficient at model making using timber as a basis in many scales. Many of us in the Club owe much to John in teaching us the art of model making. We know John would be deeply humbled to think we make this award in his name each year. By the way we make a point of not awarding this cup to any of our own club layouts. This not because many of you don't think they are deserving of an award but we are keen to celebrate the quality of our visiting layouts to our exhibitions.